This heavy duty webbing slings sewing machine ordered by a Bulgarian company specializes in production of lifting slings, cargo lashing straps and ropes, located in Varna, Bulgaria. 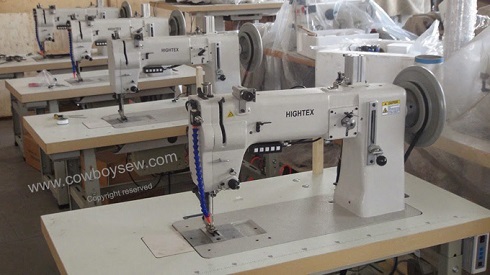 This automatic lashing straps sewing machine ordered by a Bulgarian company specializes in production of lifting slings, cargo lashing straps and ropes, located in Varna, Bulgaria. 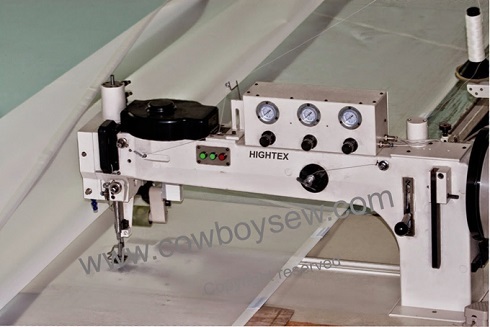 Hightex 828B Automatic hot knife webbing cutting machine for heavy duty lifting slings and straps: this heavy duty industrial length cutting machine is designed for heat cutting 200mm webbing made of Nylon, Polyester, Polypropylene. The temperature of top and bottom heating blades is up to 600 C, can melting 10mm thick textile slings without any difficult. 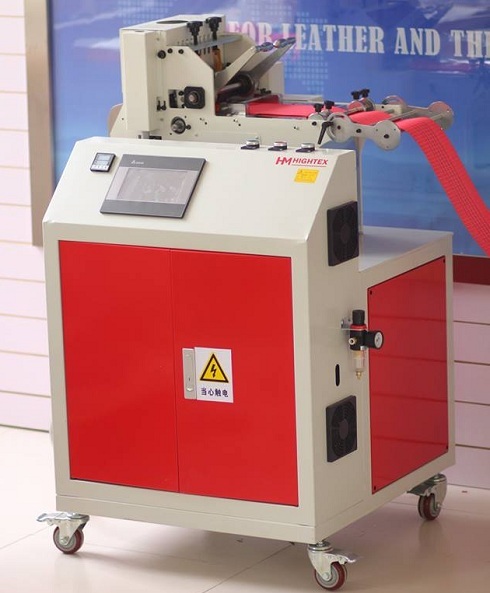 This automatic webbing strap cutting machine purchased by a Bulgarian company specializes in production of lifting slings, cargo lashing straps and ropes, located in Varna, Bulgaria. This long arm zigzag sail sewing machine purchased by a sail maker in Varna, Bulgaria. 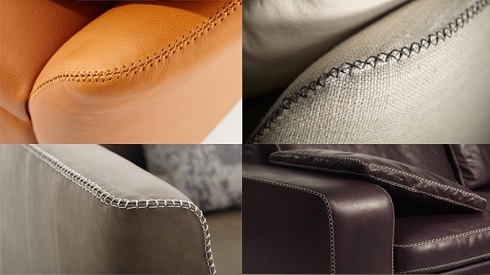 204-102MD Thick thread ornamental stitching sewing machine leather sofas: The special roller presser foot can easily sewing corners of leather sofas & armchair, recliner chairs, leather car seat covers. 6 different cams for up to 12 different decorative stitches, including T-stitch, Box-stitch, Zigzag bar-tacking etc. Post bed sewing machine for thick thread, double needle decorative seam or ornamental seam on leather: HighTex 204-370-PRO Post bed sewing machine twin needle, triple feed, crochet Barrel, suitable for twin needle decorative stitches or ornamental stitches on leather with braided thread. 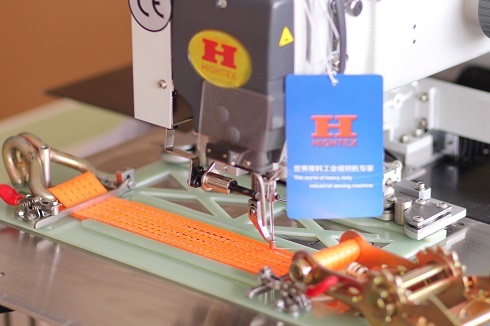 The latest thick thread topstitching technology, combined all advantages of above sewing machines, for example triple feeding system, rotary needle bar (to perform various ornamental stitch), Barrel shuttle hook and post bed design. 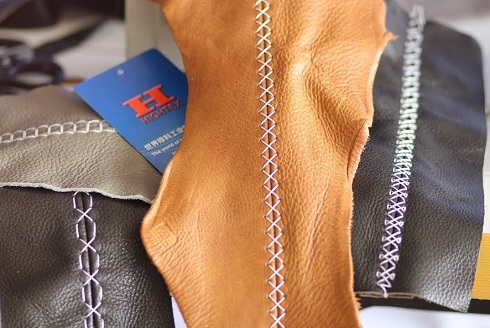 It is the best decorative stitching machine for high end leather sofa and arm chair manuacturers. This leather sofa decorative stitching machine is purchased by producer of upholstered furniture and leather sofa in Lovech, Bulgaria. 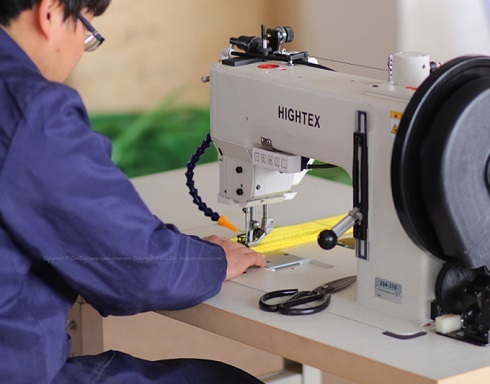 This heavy duty webbing sewing machine ordered by a ropes-slings manufacturer, and a polyester webbing line producer in Varna, Bulgaria.